CHAPTER VIII. Floating down the River.--It begins to roar.--Thirty Miles a Day.--Brown's Hole.--Lose the Boat and make two Canoes.--Elk.--The Cañons get Deeper.--Floundering in the Water.--The Indian Camp.--Chief Walker proves a Friend.--Describes the Terrible Cañon below Them.--Advises Them to go no farther down.--Decide to go Overland.--Dangerous Route to Salt Lake.--Meets Bennett near there.--Organize the Sand Walking Company. CHAPTER IX. The Southern Route.--Off in Fine Style.--A Cut-off Proposed.--Most of Them Try it and Fail.--The Jayhawkers.--A New Organization.--Men with Families not Admitted.--Capture an Indian Who Gives Them the Slip.--An Indian Woman and Her Children.--Grass Begins to Fail.--A High Peak to the West.--No Water.--An Indian Hut.--Reach the Warm Spring.--Desert Everywhere.--Some One Steals Food.--The Water Acts Like a Dose of Salts.--Christmas Day.--Rev. J.W. Brier Delivers a Lecture to His Sons.--Nearly Starving and Choking.--An Indian in a Mound.--Indians Shoot the Oxen.--Camp at Furnace Creek. CHAPTER X. 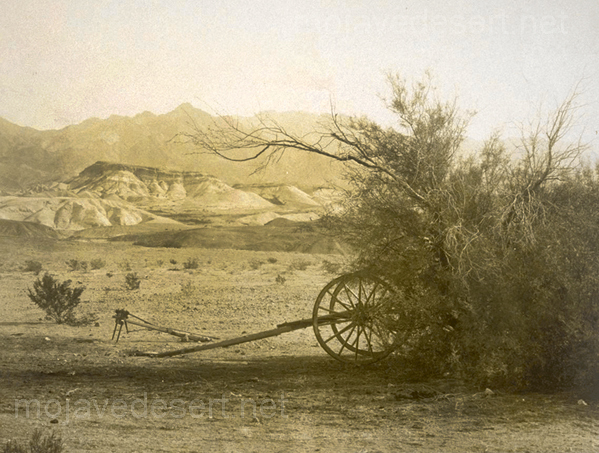 A Long, Narrow Valley.--Beds and Blocks of Salt.--An Ox Killed.--Blood, Hide and Intestines Eaten.--Crossing Death Valley.--The Wagons can go no farther.--Manley and Rogers Volunteer to go for Assistance.--They Set out on Foot.--Find the Dead Body of Mr. Fish.--Mr. Isham Dies.--Bones along the Road.--Cabbage Trees.--Eating Crow and Hawk.--After Sore Trials They Reach a Fertile Land.--Kindly Treated.--Returning with Food and Animals.--The Little Mule Climbs a Precipice, the Horses are Left Behind.--Finding the Body of Captain Culverwell.--They Reach Their Friends just as all Hope has Left Them.--Leaving the Wagons.--Packs on the Oxen.--Sacks for the Children.--Old Crump.--Old Brigham and Mrs. Arcane.--A Stampede [Illustrated.] --Once more Moving Westward.--"Good-bye, Death Valley." CHAPTER XI. Struggling Along.--Pulling the Oxen Down the Precipice [Illustrated.] --Making Raw-hide Moccasins.--Old Brigham Lost and Found.--Dry Camps.--Nearly Starving.--Melancholy and Blue.--The Feet of the Women Bare and Blistered.--"One Cannot form an Idea How Poor an Ox Will Get." --Young Charlie Arcane very Sick.--Skulls of Cattle.--Crossing the Snow Belt.--Old Dog Cuff.--Water Dancing over the Rocks.--Drink, Ye Thirsty Ones.--Killing a Yearling.--- See the Fat.--Eating Makes Them Sick.--Going down Soledad Cañon--A Beautiful Meadow.--Hospitable Spanish People.--They Furnish Shelter and Food.--The San Fernando Mission.--Reaching Los Angeles.--They Meet Moody and Skinner.--Soap and Water for the First Time in Months.--Clean Dresses for the Women.--Real Bread to Eat.--A Picture of Los Angeles.--Black-eyed Women.--The Author Works in a Boarding-house.--Bennett and Others go up the Coast.--Life in Los Angeles.--The Author Prepares to go North. CHAPTER XII. Dr. McMahon's Story.--McMahon and Field, Left behind with Chief Walker, Determine to go down the River.--Change Their Minds and go with the Indians.--Change again and go by themselves.--Eating Wolf Meat.--After much Suffering they reach Salt Lake.--John Taylor's Pretty Wife.--Field falls in Love with her.--They Separate.--Incidents of Wonderful Escapes from Death. CHAPTER XIII. Story of the Jayhawkers.--Ceremonies of Initiation--Rev. J.W. Brier.--His Wife the best Man of the Two.--Story of the Road across Death Valley.--Burning the Wagons.--Narrow Escape of Tom Shannon.--Capt. Ed Doty was Brave and True.--They reach the Sea by way of Santa Clara River.--Capt. Haynes before the Alcalde.--List of Jayhawkers. CHAPTER XIV. Alexander Erkson's Statement.--Works for Brigham Young at Salt Lake.--Mormon Gold Coin.--Mt. Misery.--The Virgin River and Yucca Trees.--A Child Born to Mr, and Mrs. Rynierson.--Arrive at Cucamonga.--Find some good Wine which is good for Scurvy.--San Francisco and the Mines.--Settles in San Jose.--Experience of Edward Coker.--Death of Culverwell, Fish and Isham.--Goes through Walker's Pass and down Kern River.--Living in Fresno in 1892. CHAPTER XV. The Author again takes up the History.--Working in a Boarding House, but makes Arrangements to go North.--Mission San Bueno Ventura.--First Sight of the Pacific Ocean.--Santa Barbara in 1850.--Paradise and Desolation.--San Miguel, Santa Ynez and San Luis Obispo.--California Carriages and how they were used.--Arrives in San Jose and Camps in the edge of Town.--Description of the place.--Meets John Rogers, Bennett, Moody and Skinner.--On the road to the Mines.--They find some of the Yellow Stuff and go Prospecting for more--Experience with _Piojos_--Life and Times in the Mines--Sights and Scenes along the Road, at Sea, on the Isthmus, Cuba, New Orleans, and up the Mississippi--A few Months Amid Old Scenes, then away to the Golden State again. CHAPTER XVI. St. Louis to New Orleans, New Orleans to San Francisco--Off to the Mines Again--Life in the Mines and Incidents of Mining Times and Men--Vigilance Committee--Death of Mrs. Bennett. CHAPTER XVII. Mines and Mining--Adventures and Incidents of the Early Days--The Pioneers, their Character and Influence--- Conclusion.